The Killing Fields (Khmer: វាលពិឃាត, Khmer pronunciation: [ʋiəl pikʰiət]) are a number of sites in Cambodia where collectively more than a million people were killed and buried by the Khmer Rouge regime, during its rule of the country from 1975 to 1979, immediately after the end of the Cambodian Civil War (1970–1975). 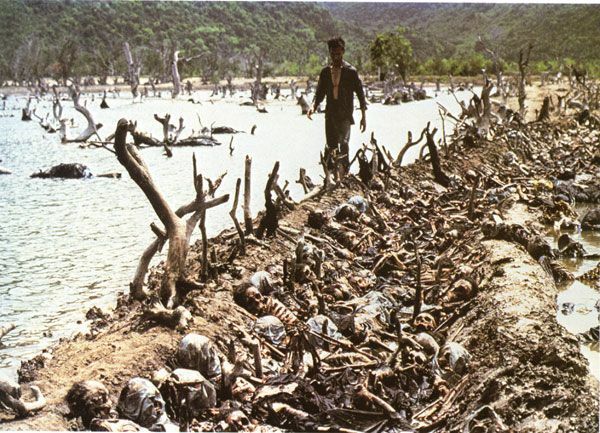 The mass killings are widely regarded as part of a broad state-sponsored genocide (the Cambodian genocide). Analysis of 20,000 mass grave sites by the DC-Cam Mapping Program and Yale University indicate at least 1,386,734 victims of execution. Estimates of the total number of deaths resulting from Khmer Rouge policies, including disease and starvation, range from 1.7 to 2.5 million out of a 1975 population of roughly 8 million. In 1979, Vietnam invaded Democratic Kampuchea and toppled the Khmer Rouge regime. Ben Kiernan estimates that about 1.7 million people were killed. A UN investigation reported 2–3 million dead, while UNICEF estimated 3 million had been killed. Demographic analysis by Patrick Heuveline suggests that between 1.17 and 3.42 million Cambodians were killed, while Marek Sliwinski suggests that 1.8 million is a conservative figure. Even the Khmer Rouge acknowledged that 2 million had been killed—though they attributed those deaths to a subsequent Vietnamese invasion. By late 1979, UN and Red Cross officials were warning that another 2.25 million Cambodians faced death by starvation due to “the near destruction of Cambodian society under the regime of ousted Prime Minister Pol Pot,” who were saved by international aid after the Vietnamese invasion. Cambodia’s ethnic minorities constituted 15 percent of the population in pre-Khmer Rouge era. Of the 400,000 Vietnamese who lived in Cambodia before 1975, some 150–300,000 were expelled by the previous Lon Nol regime. When Pol Pot‘s Khmer Rouge came to power, there remained about 100–250,000 Vietnamese in the country. Almost all of them were repatriated by December 1975. The Chinese community (about 425,000 people in 1975) was reduced to 200,000 during the next four years. In the Khmer Rouge’s Standing Committee, four members were of Chinese ancestry, two Vietnamese, and two Khmers. Some observers argue that this mixed composition makes it difficult to argue that there was an intent to kill off minorities. One estimate is that out of 40,000 to 60,000 monks, only between 800 and 1,000 survived to carry on their religion. We do know that of 2,680 monks in eight monasteries, a mere seventy were alive as of 1979. As for the Buddhist temples that populated the landscape of Cambodia, the Khmer Rouge destroyed 95 percent of them, and turned the remaining few into warehouses or allocated them for some other degrading use. Amazingly, in the very short span of a year or so, the small gang of Khmer Rouge wiped out the center of Cambodian culture, its spiritual incarnation, its institutions….As part of a planned genocide campaign, the Khmer Rouge sought out and killed other minorities, such as the Moslem Cham. In the district of Kompong Xiem, for example, they demolished five Cham hamlets and reportedly massacred 20,000 that lived there; in the district of Koong Neas only four Cham apparently survived out of some 20,000. The judicial process of the Khmer Rouge regime, for minor or political crimes, began with a warning from the Angkar, the government of Cambodia under the regime. People receiving more than two warnings were sent for “re-education,” which meant near-certain death. People were often encouraged to confess to Angkar their “pre-revolutionary lifestyles and crimes” (which usually included some kind of free-market activity; having had contact with a foreign source, such as a U.S. missionary, international relief or government agency; or contact with any foreigner or with the outside world at all), being told that Angkar would forgive them and “wipe the slate clean.” This meant being taken away to a place such as Tuol Sleng or Choeung Ek for torture and/or execution. In 1997 the Cambodian government asked for the UN’s assistance in setting up a genocide Tribunal. It took nine years to agree to the shape and structure of the court – a hybrid of Cambodian and international laws – before the judges were sworn in in 2006. The investigating judges were presented with the names of five possible suspects by the prosecution on July 18, 2007. On September 19, 2007 Nuon Chea, second in command of the Khmer Rouge and its most senior surviving member, was charged with war crimes and crimes against humanity. He faced Cambodian and foreign judges at the special genocide tribunal and was convicted on 7 August 2014 and received a life sentence. On July 26, 2010 Kang Kek Iew (aka Comrade Duch), director of the S-21 prison camp, was convicted of crimes against humanity and sentenced to 35 years’ imprisonment. His sentence was reduced to 19 years, as he had already spent 11 years in prison. On February 2, 2012, his sentence was extended to life imprisonment by the Extraordinary Chambers in the Courts of Cambodia. The best known monument of the Killing Fields is at the village of Choeung Ek. Today, it is the site of a Buddhist memorial to the victims, and Tuol Sleng has a museum commemorating the genocide. The memorial park at Choeung Ek has been built around the mass graves of many thousands of victims, most of whom were executed after they had been transported from the S-21 Prison in Phnom Penh. The utmost respect is given to the victims of the massacres through signs and tribute sections throughout the park. Many dozens of mass graves are visible above ground, many which have not been excavated yet. Commonly, bones and clothing surface after heavy rainfalls due to the large number of bodies still buried in shallow mass graves. It is not uncommon to run across the bones or teeth of the victims scattered on the surface as one tours the memorial park. If these are found, visitors are asked to notify a memorial park officer or guide. John Dawson Dewhirst (1952 – c. August 1978) was a British teacher and amateur yachtsman who was one of nine western adventurers, and two Britons, known to fall victim to the Khmer Rouge during the genocidal rule of Pol Pot. Dewhirst was born in the Jesmond district of Newcastle Upon Tyne in 1952. His father was a headmaster, and his mother ran an antiques shop. In 1963, at age 11, the Dewhirst family moved to Cumbria. While growing up in Cumbria, Dewhirst became a sports enthusiast, and took a liking to outdoor activities. He spent most of his boyhood roaming the Cumbrian countryside. At Appleby Grammar School, Dewhirst developed a love for poetry and aspired to be a novelist. After finishing his A Levels, he won an English scholarship to study at Loughborough University. While studying at Loughborough University, he trained as a teacher. After receiving his degree in teaching, his desire for adventure and to become a writer drove him to travel to Tokyo, Japan to teach English in 1977. Some time in July 1978, while visiting a friend in the eastern Malaysian town of Kuala Terengganu—on the slow road from Japan back to England—26-year-old Dewhirst met Canadian Stuart Glass and New Zealander Kerry Hamill, co-owners of a little Malaysian bedar (traditional, double-ended wooden boat) named Foxy Lady. The three spent several weeks or a month together in Kuala, and then headed north to Bangkok. For reasons that are unclear, Foxy Lady ended up in Cambodian waters and was seized, off Koh Tang, by a patrol vessel attached to Division 164 of the Revolutionary Army of Kampuchea. Foxy Lady may have been on its way to Bangkok to pick up a load of Thai sticks. Glass had engaged in hashish smuggling before. Dewhirst’s history in this area is unknown. His Kuala Terengganu friend—now in her seventies—recalls Dewhirst speaking of planned adventures. Glass was shot and killed, or drowned, during the seizure. Dewhirst and Hamill may have been held for several days on a nearby island, and were then trucked off to Democratic Kampuchea’s preeminent death house—S-21. In early 1979, Vietnam invaded Democratic Kampuchea and overthrew the Pol Pot regime. 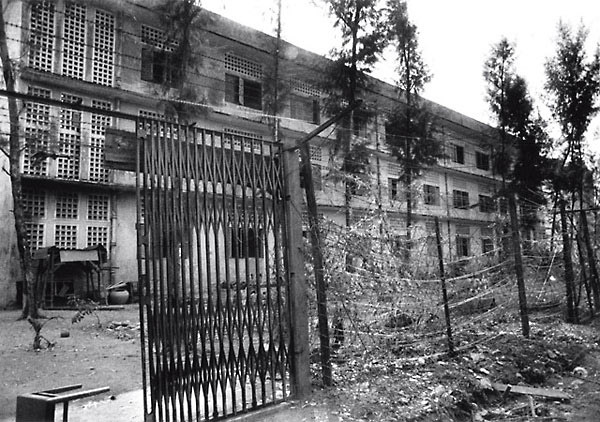 They liberated Democratic Kampuchea’s S-21 prison in the capital Phnom Penh where over 14,000 Cambodians had been killed, many of them for supposedly spying against Cambodia. Alleged photographs and forced confessions of nine missing Western yachtsmen (four Americans, two Australians, plus those of John Dewhirst and Kerry Hamill) were found in the prison files. The confessions of Dewhirst and Hamill revealed that they had been seized by a Khmer Rouge patrol vessel near the island of Koh Tang on the evening of 13 August 1978. Stuart Glass, the Canadian befriended by Dewhirst and Hamill, had been shot and killed during Foxy Lady‘s capture. Hamill and Dewhirst were both brought ashore and then taken by truck to Phnom Penh. Like the other Western yachtsmen, they were almost certainly tortured. The extent of their mistreatment is not clear. Dewhirst wrote several long confessions that mixed true events in his life with wholly false accounts of his career as a CIA agent planning to subvert the Khmer Rouge regime. He claimed that his father (also an agent) had been paid a large bribe for inducting his son into the CIA and that his college course in Loughborough was interspersed with training as a spy. Dewhirst and Hamill signed a series of confessions between September 3 and October 13, 1978. John Dawson Dewhirst’s first page of a forced confession when being tortured by the Cambodian Pol Pot Regime in the S-21 prison in Phnom Penh. The former administrator of the prison, Comrade Duch, said that he remembered Dewhirst as “very polite”. The circumstances of the deaths of Dewhirst and Hamill remain unclear. Their deaths were first reported in late 1979 and early 1980 by ABC News journalist Jim Laurie and freelance photographer Edward Rasen. Rasen provided more details, including photographs and portions of confessions in stories for the UK publication NOW! and the Australian Bulletin. During the 2009 trial of S-21 chief Kang Kek Iew (aka Duch), a former S-21 guard named Cheam Sour claimed that one of the eight Western yachtsmen held at S-21 was burned to death. Sensational reports that this individual was John Dewhirst are unsubstantiated. On 10 November 2005, in an interview, John Dewhirst’s sister, Hilary Dewhirst-Holland told interviewers that she wants her brother’s case to be detailed in the prosecution indictment against Duch. During Comrade Duch’s trial beginning in 2007, Hillary did not attend the trial to testify against Duch. Instead, she handed a note to Rob Hamill, younger brother of Kerry Hamill, to share with the court. On 27 August 2009, Rob Hamill appeared before the Extraordinary Chambers in the Courts of Cambodia (Khmer Rouge Tribunal) as a civil party in Case 001, against Comrade Duch. In April 2011, Hamill applied to the ECCC once more for civil party status in ECCC Case 003, believed to involve former Khmer Rouge chief Meas Mut. As “Secretary” of Democratic Kampuchea’s Division 164—comprising the nation’s navy—Mut would have been responsible for the gunning down of Stuart Glass and the seizure of Foxy Lady‘s two other crew, Kerry Hamill and John Dewhirst—not to mention the arrest of the other six Western yachtsmen. As the trial of a notorious Cambodian prison guard Duch draws to a close, the sister of the only Briton to die in the Killing Fields says Duch should never be freed. When a slightly built, bespectacled former revolutionary is sentenced on Monday for ordering the deaths of more than 14,000 people, Cambodians will at last see justice being done for one of the 20th century’s greatest crimes. Thousands of miles away on the moors of rural Cumbria, so will a solicitor whose brother fell victim to Pol Pot’s murderous regime in 1978 when an adventure went horribly wrong. John Dewhirst, a 26-year-old teacher from Cumbria, was enjoying one last trip before returning home, sailing through the Gulf of Thailand in a motorised junk called Foxy Lady. All went well until he and his friends came too close to the coast of Cambodia, then a closed land whose rulers had instituted a chilling reign of terror. They were seized by Khmer Rouge coastguards and taken from their boat to a torture centre in the capital Phnom Penh. There Mr Dewhirst was brutally interrogated and forced to make the ludicrous confession that he was a CIA spy, before being slaughtered in what became known as the killing fields – the only Briton among the hundreds of thousands to die there.